Last edited by Alice; 2nd March 2018 at 10:34 PM. XSE uses dynamic offsets - meaning it automatically searches for free space from a given beginning offset. 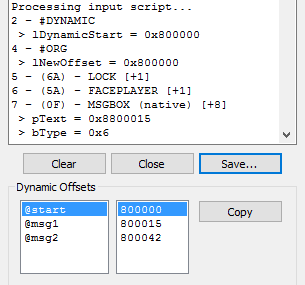 For the sake of this tutorial, we'll use #dynamic 0x800000, although it can technically be any free offset. 0x800000 and upwards is generally the safest, as from that point onwards there is a lot of free space to use. Thus, below should be the first line of your script. This means that every script you compile from now on will automatically compile to the first free offset it finds after 0x800000. Above is your basic layout. 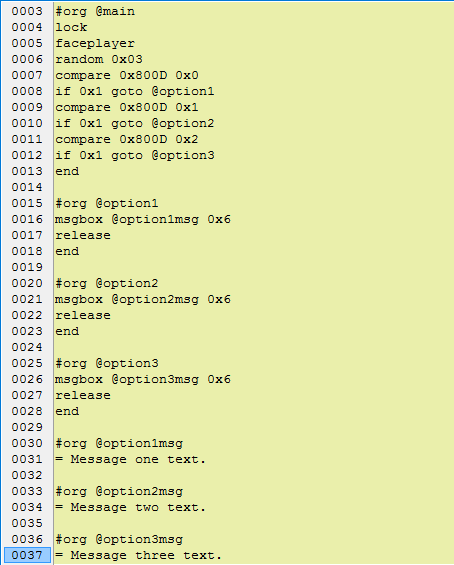 This tells the game to compile the script labelled @main to free space anywhere above 0x800000. A Person Event/NPC Green "P"
Last edited by Avara; 1st March 2018 at 10:07 PM. Let's start with a basic NPC - we want to make someone face us and say hi, or in scripting terms, display a string of text. We do this with a msgbox. So, we have quite a few new additions here. lock prevents the player from moving. Alternatively, lockall stops all NPCs on the map from moving. Should come directly after your #org @main but before your msgbox. faceplayer is fairly self explanitory too; it just makes the NPC face the PC before talking. release lets the player move again. If you used lockall instead, you'll have to use releaseall. After release or releaseall, finish with end. #org @greeting is a pointer to our text string, "= Hi!". I'll go into more detail on text info later, but the "=" basically tells XSE it's the start of a string, or line of text. That script will make someone face you and say "Hi!". Alternatively, there is a shorter way of scripting NPCs: msgbox 0x2. Using the above version, msgbox 0x2, means you don't need the lock, faceplayer or release commands, whereas msgbox 0x6 does. Both scripts do exactly the same thing. msgbox 0x3 is used in the original games for signposts; it displays the sign textbox when used on an actual signpost tile. Like 0x2, you don't need the lock, faceplayer or release commands. msgbox 0x4 is a normal textbox just like 0x6, in that you need the lock, faceplayer and release commands surrounding it. The difference here is that the textbox will stay open, meaning we require a new command to make it go away, closeonkeypress. As I mentioned before, the "=" before your desired script's text lets the program know you want the text that follows it to be displayed. Of course, there's a limit to how long the text can be - to ensure you're never wrong, use the Text Adjuster. = Hi! My name is Adam.\nWhat's your name? [.]\l[.][player]? The [.] adds a little suspension point "..." in the actual text. [player] will show up as the player's name in-game. Similarly, [rival] displays the rival's name. We can display more than just the player or rival's name similarly, using buffer commands. These let you show the name of a Pokémon, item, attack or number. = Wow, your [buffer1] is so cool! Like before, you need to assign the Pokémon's name to a buffer number. Using that list of hex IDs from earlier, you can then choose a Pokémon's name to display. Let's pick Venusaur for example, or the Pokémon ID number 3. Here's an example combining bufferfirstpokemon and bufferpokemon, assigning them to buffer numbers 1 and 2 respectively. = Your [buffer1] is so cool, but\nmy [buffer2] is tougher! In-game, this will show up as "Your [first party member] is so cool, but my Venusaur is tougher!" in FR, or EM "Your [first party member] is so cool, but my Sceptile is tougher!" (I assume). All you have to do is choose your buffer number as before, and an item ID. For the sake of the tutorial, let's use item ID #1 - a Master Ball in both FR and EM. = I wish I had a [buffer1]. ... Or an attack ID. For the sake of the tutorial, let's use item ID #1 - Pound. = The only attack my Pokémon\nknows is [buffer1]. If you're using the "stdattacks.rbh" file as demonstrated below, you can substitute the attack ID for how it's defined there, so for the same attack, Pound (0x1) can simply be "ATK_POUND". The buffernumber command isn't as straightforward. It actually shows the numerical value of a variable. 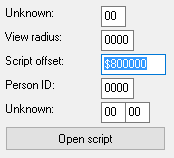 We'll go into more detail on variables later, but let's use 0x8000 and its value is 100 for example purposes. With buffernumber we choose the number of the buffer to display, and then the variable we want the value of to get our desired number. In this case, we've assumed var 8000 contains our desired number, 100. = My Charizard grew to level [buffer1]! Adding color to your text is a nice way of differentiating characters and making item or place names stand out. Last edited by Avara; 1st March 2018 at 10:08 PM. Let's start the next section with something nice and simple, shall we? Throwback to our msgbox command. 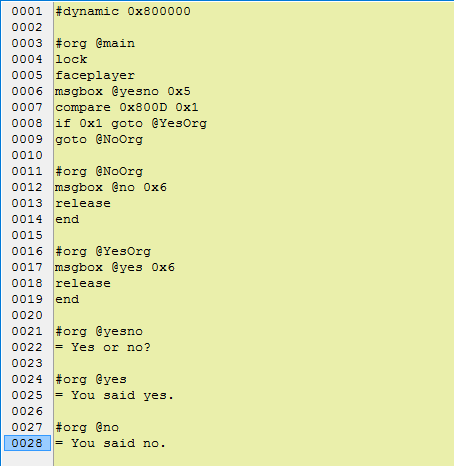 This time we'll be looking at msgbox 0x5, or in other words, making a script where the player can answer "Yes" or "No". The goto command is exactly as it sounds; it literally tells the script to go to another pointer. 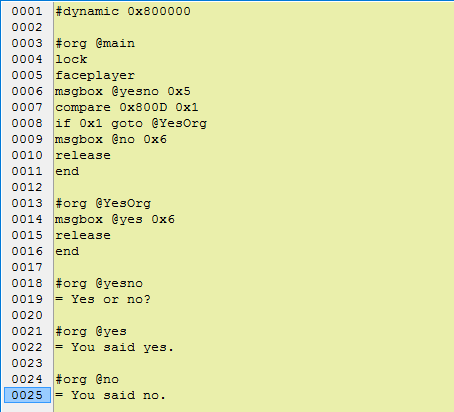 compare 0x800D, or compare LASTRESULT gets the result of the player's choice - in msgbox 0x5's case, 0x0 for 0 "No" or 0x1 for 1 "Yes". 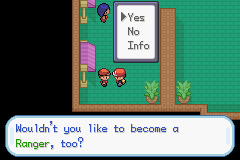 Notice that when the player chooses "Yes", it doesn't go straight to the msgbox command which displays the text. This needs to be contained in its own script section, hence why I named the pointer "@YesOrg" for convenience. If you accidentally send your "Yes" pointer to the pointer for the text string(@yes) instead of the script section it's contained in (@YesOrg), bugs will follow. If the LASTRESULT, or 0x800D is not 0x1 for "Yes" it will not goto @YesOrg, it just continues the script, meaning it displays the text string for @no and closes. goto works just as well - the example below will give you the exact same results as the script above. Now we've covered random, we can move onto multichoice. For those of you who don't know what a multichoice box is, here's an example. *Refer to multichoice IDs provided. preparemsg prepares a text string to display and waitmsg is self explanitory, it just makes sure the full text is displayed before opening the multichoice box. 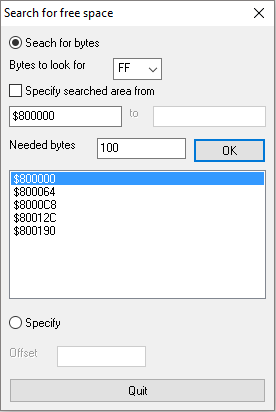 The copyvar command here copies the result stored in LASTRESULT to var number 8000 so it can be compared to the result of the player's choice. More on vars later. 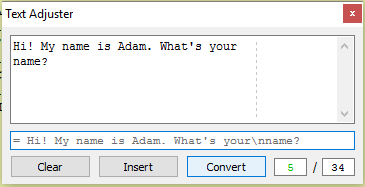 Depending on the player's choice, you can make the script goto a different @pointer. karatekid552 and DavidJCobb did an excellent job of referencing every flag and variable in the FireRed ROM and what they do. If you hack FR, this documentation will be invaluable to you. Emerald hackers will find this information on flags/vars useful. Let's move on to variables. What if we want to copy the value of one variable into another? The above line just takes the value of Var #1 and stores it in Var #2. Now that we know how to add to, subtract from and set a variable, how do we check it? What we're telling the script to do here is check that 4011 is equal to 3, and if it is to go to @pointer. Before you think about the multitude of free items you can give your players, you should always make sure they can actually take the item first! This neat little command checks if you have enough room in your bag for the amount of the desired item. If your bag is full, the last line sends you to @pointer. Nice and simple, and this way you even get a little message box automatically generated to notify the player that they've received the item. There is another way of giving the player an item "silently", meaning no pop-up notification. = [black_fr][player] received a [green_fr]Master\nBall[black_fr] from Atenza! Let's see an example and check if the player has one Master Ball. I used if 0x4 instead of 0x1 because this time, we're checking not that we have exactly one Master Ball - we're checking that we have more than one before we go to our pointer @Has. Useful in cases where a player's bag might be full, but you want them to receive an item anyway. = Do you like grass-types? = Your party is full. = You can have one of mine! = [black_fr][player] received a Pokémon! = [black_fr]Give it a nickname? 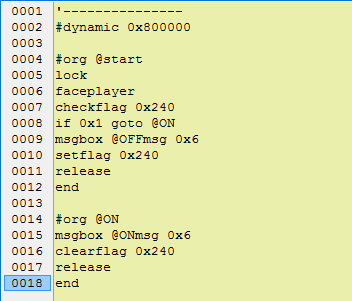 First section checks if flag 0x240 is set, and if it is, go to the pointer @done. Next section asks the player a question. If they answer "Yes", or the result is 1, the script goes to pointer @Yes. If they said "No", they just say a line of text and the script ends there. By the way, LASTRESULT can be substituted for 0x800D, which is a bit harder to remember! This is the beginning of the @Yes pointer. countpokemon is fairly self explanitory, it counts how many party members you have. compare 0x800D 0x6 compares the result of countpokemon to 6, and if it is 6, the script goes to the pointer @Full. The next part is music related which we'll cover in more detail later. 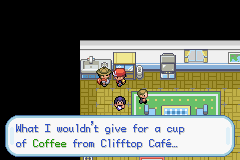 All this section does is play the little level-up jingle and display a message notifying that the player's received a Pokémon. We've used msgbox 0x4 here, followed by waitfanfare then closeonkeypress, which prevents the message from being closed until the jingle has finished playing, similarly to how the pop-up message for finding items on the ground is. Fairly straightforward repeat - this part asks the player if they want to give their new party member a nickname. The difference here is that instead of goto we've used call instead. call will jump to a pointer, and then back to the original script with return. In our nickname pointer that we've momentarily jumped to, we call 0x81A74EB - this will jump to the nicknaming screen in FireRed*. return takes us back to our original script when the nicknaming screen is exited. *If you're hacking Emerald, 0x2723DD for nicknaming instead of 0x81A74EB. Those are just pointers to already existing in-game scripts containing specials, which we'll cover much later! So, to give a Bulbasaur egg, we'd have giveegg 0x1. We use waitcry to ensure that the cry has finished playing before continuing the script - in this case, the textbox won't go away until then. You don't have to use it, just keep in mind that if you choose not to, the script will continue as the cry sound plays. It's really up to you. One thing quite a few people seem not to be aware of is that there's actually a variety of different effects that you can use to change the sound of your desired cry - you don't have to use 0x0 after specifying the Pokémon, contrary to popular belief! I tested each cry effect in both FireRed and Emerald and have done my best to identify them, but seeing as I had no exact documentation to refer to I could definitely be inaccurate. All you have to do is choose the ID number of the fanfare you want from this list and put it after the 0x. waitfanfare means the script will wait for the sound to finish playing before continuing. That's literally it. If you want to make the script wait for the sound to finish before continuing, you can add waitsound if you want to. Similarly to the others, use the ID of your desired music after playsong 0x, only you need that 0x0 at the end! There are a variety of ways to revert or change the music. Entering a battle after using the playsong command will also change the music back to default, so if you want to continue your music for the remainder of your script, you'll need another playsong straight after the battle. fadesong, as the name suggests, fades your song into another nicely so it doesn't just abruptly cut to the next music. fadeout fades the song that was playing to silence. pause 0x1 does what it says on the tin, it's just a small pause which lasts for approximately half a second. fadein fades the song that was playing back in from silence.